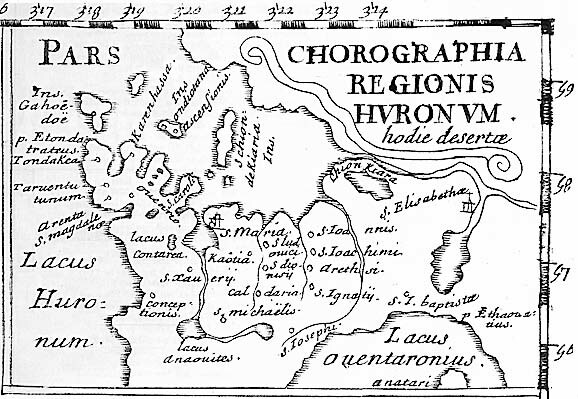 Huronia Chapter - Ontario Archaeological Society: tell me about Leagues? I understand that in there is some possibility of confusion around distances measured in leagues. How long was a league in the 1600s? My first understanding of a league was the conversion figure of 3 statute miles. I have since learned that while 3 miles may be accurate while at sea, a distance of 2.5 was more likely on land. Others have said that one league was equal to the distance that one could travel in one hour on land or prehaps on water in a canoe. It may have been easier to mark time than it was to measure distances and time taken to travel was probably more relevant to the traveler than was the projected distance. This would hold true for relatively short distances, longer ones would be later measured by instruments that not all carried or knew how to use. I like the distance over time senerio in most circumstances. I may have read somewhere that the distance of a league was different in the various regions of France- that there was not one standard measurement. This may hold true for all of Europe. When one uses a measure of "one hour walking"- it would also depend on the terrain etc. lieue- the French league. A variety of lieue units were used for land measurement in France, but generally these units were around 2.4-2.5 statute miles in length. In the 18th century, the legal unit was the lieue de poste, defined to equal 2000 toises or 2 milles (2.4221 miles or 3898 meters). In metric France the lieue is now considered to equal exactly 4 kilometers (2.4855 miles). See league (above). At sea, the lieue was often taken to equal 1/25 degree  or 2.4 nautical miles (4445 meters or 2.7619 miles); this unit was gradually replaced by the internationally recognized 3 nautical miles (5556 meters or 3.452 miles).